Eleven Handmade is one of my favorite crochet garment designers. She does some really amazing designs. I love the color blocking on this cinnamon dress – so high fashion! This crochet pattern can be bought on Ravelry. 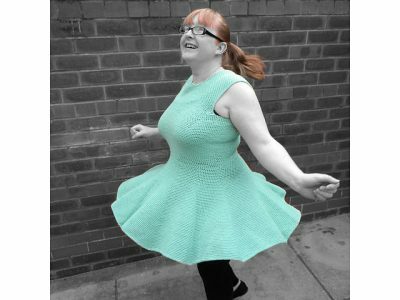 Ravelry’s FashionMartina has many great crochet dress designs for women. She’s especially good at doing striped crochet designs. I especially like this one, which is called Magic Girl. 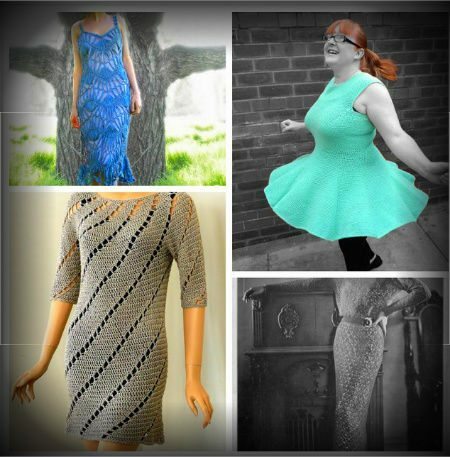 This Diana Dress by Sara Dudek is the most popular adult women’s crochet dress pattern for sale on Ravelry right now. I can see why. So stylish! Every woman needs a little black dress; make yours unique by making it in crochet! 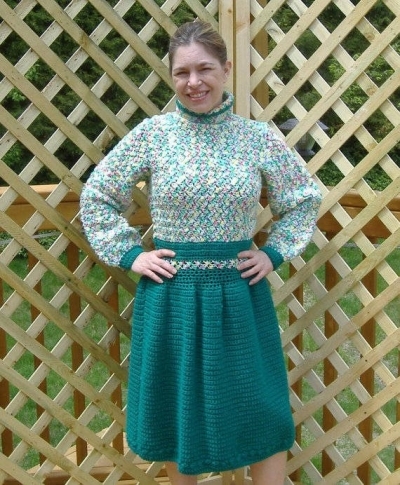 This crochet dress pattern by Mari Lynn Patrick is sold through Patternfish. 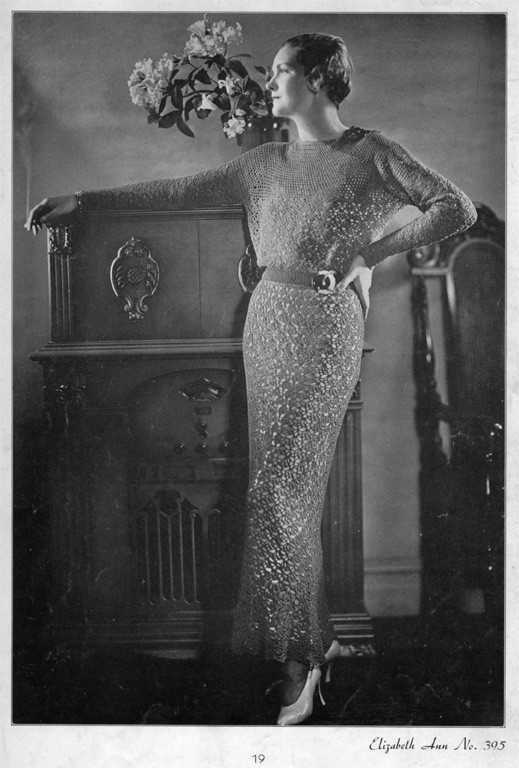 This crochet dress by Catherine Jeandel is promoted as a beach dress but I think it could be dressed up and worn out on the town at night, too. It’s sold through Patternfish. There is so much detail in this flowered crochet dress sold online through Vogue Knitting! The pattern is by Rima Mikneviciene. It dates back to 2006 but I think it’s still absolutely relevant in fashion today. This lace dress by Lily Chin can be worn as a casual day dress or for a special occasion. It could even be a casual bridal dress. It’s sold through Interweave. This Mimosa Dress pattern sold through Interweave is described as, “The silk and bamboo yarn creates a fabric that embraces the body for an elegant dress perfect for a luncheon or an afternoon wedding. The dress is worked vertically, for a long, lean look, with short rows and godets that flare the hem for a gratifying swirl when dancing.” The pattern is by Rhonda Davis. I love the cute flare on this well-fitted crochet dress by Amanda Critchley. The pattern is sold through Ravelry. 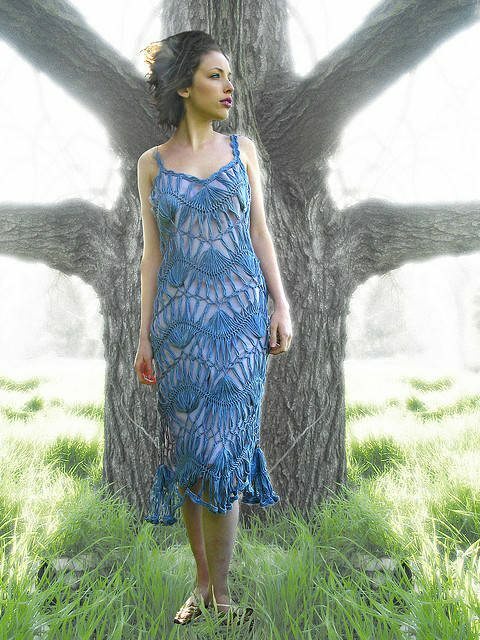 This spiral crochet dress design by Doris Chan is worked top-down for a fairly easy pattern. It’s sold through Designing Vashti. 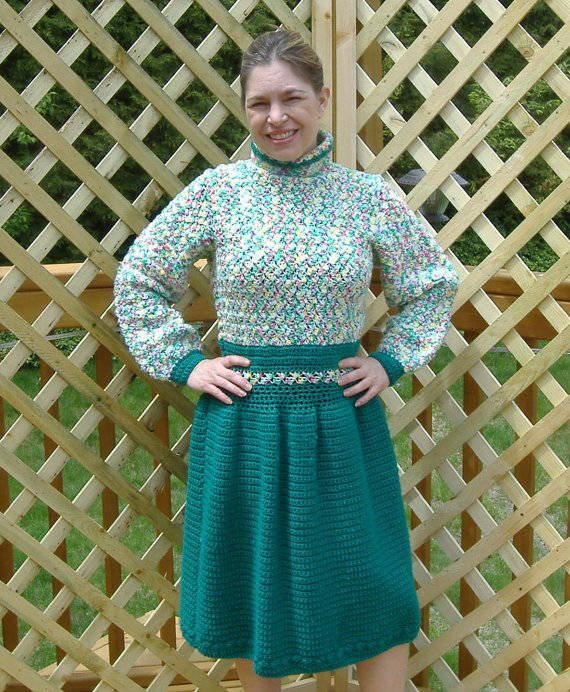 This elegant vintage crochet dress pattern is sold through Etsy by babydee. This seller offers several other vintage patterns, too. 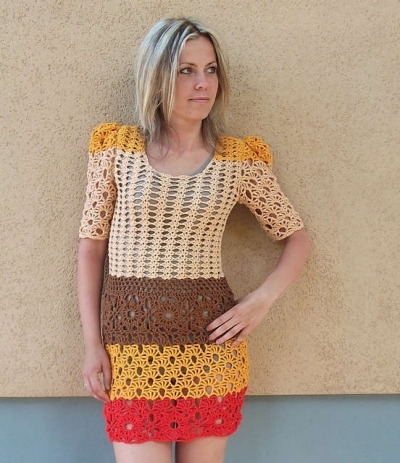 Etsy’s onhooksandneedlesct sells this finished crochet dress but also offers the crochet pattern for sale. I love the combination of a “print” top with a solid bottom and I also love the hints of retro style. I love a high waisted skirt because it creates the illusion that I’m not quite as short as I am, plus it’s flattering on the figure. 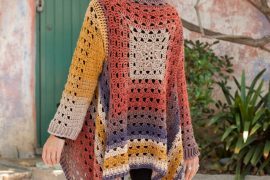 This crochet pattern offers that as well as the chance to play with some different crochet techniques including Tunisian crochet. The design, by Pyogazel, was originally published in Interweave’s crochet magazine but the pattern can now be purchased through Ravelry. Hairpin lace has such a great feminine look to it and no one does it better than Stitch Diva who designed this crochet dress pattern. It’s a try-on-as-you-go pattern to help you get the right fit. The pattern for this crochet wedding dress is very affordable on Etsy sold by marifu6a. @CrochetBlogger Love this collection. Would love to see a collection of free/paid #crochet dress patterns for baby/kids too. @thisiscarrie Thanks for the feedback. I’ll make it a point to put together such a collection soon! @FreshStitches Thanks for sharing!! By the way, finally figured out all of my link problems and it’s now fully taken care of. @Fruitful Fusion Hm, you’re right. I’m getting an Etsy page error. I’ve sent a Tweet to see if the shop owner responds. Wow, these are SPECTACULAR! I want to make most of them. Thank you for putting so many beautiful patterns in one place. I loved all these crochet frocks design. 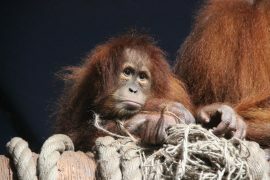 How can I weave that? Please help.